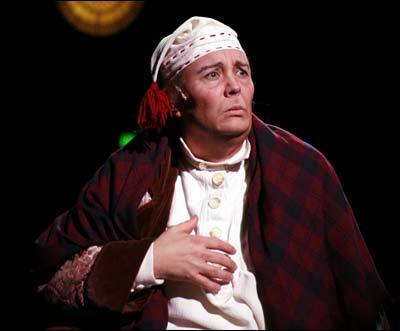 Above: David Coffee returns for his 15th consecutive year as Ebenezer Scrooge, in the North Shore Music Theatre production of "A Christmas Carol." Photo by Paul Lyden. Picture Ebenezer Scrooge as the CEO of your organization. It's enough to give HR managers nightmares. Instead of visions of sugarplums, HR managers would dream about massive layoffs and across-the-board pay cuts. Let's imagine that Scrooge is the CEO of the fictional company Winter Wonderland, Inc. Or at least he was until the undesirable behaviors he displayed throughout the year hit a pinnacle at holiday time. His outrageous gaffes between Halloween and New Year's Day were too much for his employees to bear. Given a choice between a tactless CEO and a mass employee walkout, the Board asked for Scrooge's resignation. 10. He gave out tote bags with the company logo as employee gifts-Anything with a company logo, leftover from a trade show, or pulled out of the supply closet, does not constitute a gift. Other gift-giving no-nos include: exceeding the price limit for office gift exchanges (while it may seem generous, it makes everybody else feel inadequate); "naughty" presents; and re-gifting items from last year's Yankee swap. 9. He hosted "Office Clean-up Day" for employees' children-If your organization is going to host a holiday event for employees or their children think music, food, fun, and gifts-not chores. 8. He instituted a "No Vacation" policy for the last six weeks of the year-Although it can be difficult for organizations to grant time off when their fiscal year ends December 31st, company executives need to be flexible about employees' personal obligations during the holidays. If management can't close the office during the holidays, they could give vacation days, institute a telecommuting option, or allow employees to make up hours at off times. 7. He strong-armed employees into giving to charity-his charity-Scrooge deducted a portion of all employee paychecks to make a contribution to his pet charity, The CEO Defense Fund. Company leaders should support employees in their charitable giving by offering time off to work with their favorite charity, or a corporate donation matching program. Conversely, they shouldn't force employees to support a corporate-sponsored charity. 6. He recruited office personnel to do his holiday shopping after hours-Company executives, managers, and supervisors should not expect their employees to serve as personal shoppers during the holidays. Managers should select gifts for their department members on their own. They should also purchase these gifts themselves and not expense them to the company. If a manager is too "frugal" to spring for gifts for everybody, or if it's not possible to buy all employees gifts, a manager could expense a meal at a restaurant or have a meal catered or delivered. 5. He insulted several employees' religious beliefs-Company leaders would be wise to keep all comments about Hanukah, Christmas, or Kwanza to themselves. They also shouldn't use the office as a forum to tout their own religion. 4. He banned all signs of the holidays from the office-While employees should be spared having to hear "Grandma Got Run Over By a Reindeer" from the neighboring cubicle, they should be able to celebrate the holidays in more discreet ways at work. Hanging snowflakes at their work stations or bringing in baked goods to share puts employees in a festive mood without disrupting the work environment. 3. He charged employees to attend the mandatory holiday party-Employees should never have to pay to attend an office party. They also shouldn't put up with a BYO gathering, where they are expected to bring the food, drink, and entertainment. If the organization can't afford an extravagant celebration at a fancy hotel, management could opt for a smaller scale affair at the office (as long as it isn't catered by the vending truck parked up the street). 2. He substituted a stuffed bird for a stuffed envelope-In place of the expected holiday bonuses, Scrooge gave all employees turkeys while top executives received hefty payouts. Employees look forward to-and count on-year-end bonuses. If company executives forecast restricted finances for the end of the year, they should let employees know as early as possible. And if employees can't get bonuses, neither should company leaders. Giving turkeys is fine, but it's no replacement for a bonus. Nothing disappoints employees and kills morale more than expecting a paycheck and getting poultry. 1. He dressed up as Santa and had employees sit on his lap-The use and misuse of alcohol at office holiday parties could fill up its own top ten list, but even if the boss is sober, he or she should never behave suggestively or put employees in a compromising position. Do you recognize your management team in any of these scenarios? If you do, you still have time to help steer them away from making the same mistakes that Scrooge made. If you can help your CEO and company executives avoid these faux pas, you can ensure that your company employees-and you-will have Happy Holidays! If you gave your notice today, how would people remember you? Bring a fresh perspective to work by thinking about the legacy you will leave. From being more objective to better communicating their worth, HR managers may want to take a cue from consultants to provide more value on the job. HR managers should take a cue from children this summer and create unconventional learning relationships at work. With new technology, employees can work from basically anywhere — making a 24-hour workday possible. But just because they can, doesn't mean they should. By brushing up on the five golden rules of human resources communication, HR managers can make everyone's job a little bit easier. Whether you're an avid fan of car racing, or don't know NASCAR from Madagascar, HR managers can learn something from the drivers and their teams. There are ticking time bombs at every organization that may be getting bigger and more dangerous by the day – if they are not defused. Whatever the situation, dips are a reality. It is what an organization does in the aftermath that matters most. Does your organization wallow in Dipville, or high-tail it out of town? Some topics of conversation are just wrong, and can take employees or organizations down a slippery slope. Others are beyond inexcusable in an office setting. While it is important to acknowledge employees' hard work during the holidays, it shouldn't be the only time of year your organization shows appreciation toward them. As with any campaign, it helps to have a base of support. Do you have colleagues within your organization who believe in you and the expertise you bring to your position? The word intervention can conjure up some pretty icky images, but it doesn't have to be such a negative word. In fact, it often leads to great results, especially in the workplace. A large part of an HR manager's job description is tangled up in these relationships with co-workers and outside contacts. The answers to these ten questions can help you craft your role in your organization and design a job that keeps you challenged and fulfilled. If you make a personal misstep, what can you do? Is your career over, or your job with the company? Here are some steps to follow to help get your career back on track. You think you're pretty special. You bring a lot to your department and the organization, and they are lucky to have you. There's nothing wrong with thinking this way. Most of us do. Think you can't offer cutting edge benefits? Think again. HR managers sometimes get a bad rap as the people in organizations who always say "no." But imagine for a moment that the word "no" was removed from your vocabulary for a day. Here at The Hire Authority, we know your employees' secrets. No, we're not mind readers, but we know the things that aggravate them. The dire warnings of a labor shortage remind me of the uproar over global warming. Supposedly, it is imminent and we're all going to suffer, but if it's not hurting us now, should we worry? Most of us have colleagues at work who have the traits of a married couple - the work spouses. He knows she takes her coffee black with two Splendas, and she finishes his sentences. Football coaches and players are constantly analyzing their game-their strengths, weak spots, and opponents. Good teams (those not plagued by injuries) usually don't repeat the same mistakes two weeks in a row. Let's imagine that Scrooge is the CEO of the fictional company Winter Wonderland, Inc. Or at least he was until the undesirable behaviors he displayed throughout the year hit a pinnacle at holiday time. Don't you wish you could tell people what you really think? The 360-degree assessment was designed with that goal in mind-extracting an honest and insightful look at employees and how they work. If your organization is like most, you probably have your share of complainers. You may detest listening to employees gripe about work; it can be an unpleasant part of an HR manager's role. As the war for talent heats up, companies are competing more aggressively for fewer workers-and fighting hard to keep those they already have.